In the first book in this series "Judgement Calls" Deputy District Attorney Samantha Kincaid was working in Portland’s Drug and Vice Division. After a much needed vacation following an attempt on her life she is back at work with a promotion to the Major Crimes Unit. In the early morning of the day she starts work again she gets a call about the disappearance of city administrative judge Clarissa Easterbrook. Clarissa is the wife of a top surgeon and has close friends with powerful political connections. The case rapidly goes downhill and Samantha finds herself right in the middle of a possible homicide prosecution which her bosses may not want her to handle. Kincaid soon gets involved with police investigations, and has doubts that the suspect that they have arrested may be guilty. Kincaid is a great female lead who does what she feels is needed to make sure that justice is served. This means that she frequently goes it alone and frequently upsets the police and her supervisors. In this case going alone means taking on powerful local business and political interests who may be involved in high level corruption that is difficult to prove. Samantha also has to learn to live with conflicting interests in her personal life - her current love interest who is one of the top detectives in the MCU, and her father who was once a policeman himself and understands the impact of political and business power. 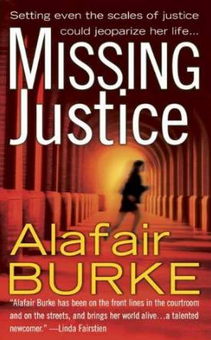 This is a very skillfully plotted, well written and legally complex thriller that clearly shows Alafair Burke's experience as a prosecutor in Portland's Attorney General's office and currently as a law professor. I have already read several of Alafair Burke's Ellie Hatcher series and have made a resolution to read the other books in the Samantha Kincaid series.